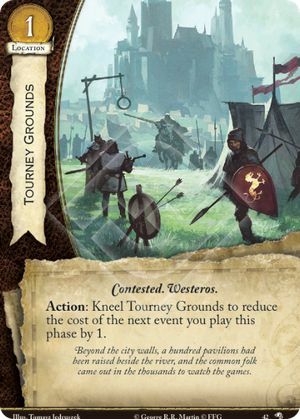 Action: Kneel Tourney Grounds to reduce the cost of the next event you play this phase by 1. Beyond the city walls, a hundred pavilions had been raised beside the river, and the common folk came out in the thousands to watch the games. Wolves of the North #42. The cost of playing an event card (that Tourney Grounds reduces) is its GOLD cost. Any cost in the text of the event is a cost of triggering the ability. It is true that when playing an event, you pay the cost of playing the card and the cost of the ability simultaneously (and you need to be able to pay both of them in order to play the card), but Tourney Grounds only interacts with the gold cost to play the card. From the RRG: "For costs involving the letter X, the value of X is defined by card ability or player choice, after which the amount paid may be modified by effects without altering the value of X." For example, you can use 2 different Tourney Grounds, then trigger Things I Do For Love and target Cersei Lannister. X is set to 4, then reduced by 1, then reduced by 1 again, and you pay 2 gold.